Forsbergs Skola provides 2-year professional training courses in graphic design/advertising, copywriting and game design. In addition, the college runs shorter evening courses and distance learning courses in other subjects such as fashion design, illustration, interactive media and programming. Forsbergs Skola was founded in autumn 1991 by Pia Forsberg and Pelle Lindberg. Both brought with them extensive experience from the industry: Pia as a book designer and illustrator, Pelle as an Art Director. Pelle, a much loved teacher, passed away in 2006 and will be greatly missed. A student scholarship has been set up in his name. When the college was established, the Board of Directors also included the two legendary brothers, Karl-Erik and Vidar Forsberg. To start with, the college ran a distance learning course in graphic design. This was unique, as no other course devoted entirely to graphic design was available in Stockholm at that time. In 1992, the college began running evening classes and moved into modest commercial premises on Vikingagatan in Stockholm. 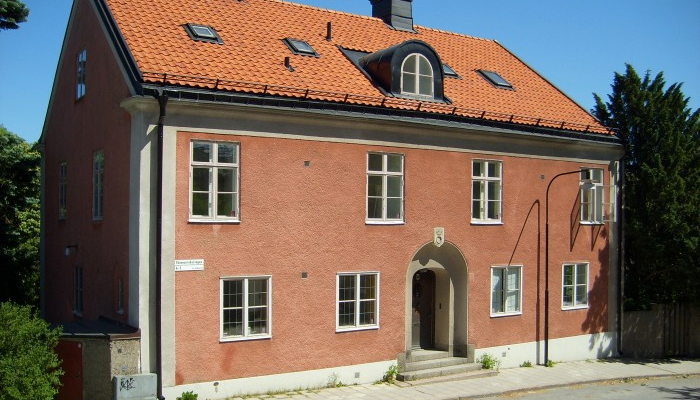 The following year, 1993, Forsbergs moved into the old Carnergie Brewery buildings on Kungsholmen, and the college opened its doors to the first class of day students. When full-time classes were started, Gabor Palotai, Marie Wollbäck, Gyula Buvary, Anders Lindholm and Håkan Lindström all joined the college staff. The course rapidly became a success, and the college expanded. Other evening classes were added, and 1998 saw the start of a full-time course in copywriting. In autumn 1999, Forsbergs moved into larger premises on Polhemsgatan, and then in 2006 the college moved once more, this time to Skinnarviksringen on Södermalm. The emphasis in the courses provided is on graphic design and advertising, with the aim of being innovative and creative in all types of design, advertising and communication. The intention is for the different lines – graphic design and copywriting – to supplement one another and to interact on various projects. The students have completed numerous exciting projects and exhibitions, both in Sweden and abroad. For example, they have held their final exhibitions in London at the Institute of Contemporary Arts (ICA), at NK, Kungsträdgården, in Soho, New York, Hovstallet, Humlegården and the Strand Hotel. They have also completed film projects in a variety of destinations all over the world – in Las Vegas, New York, Istanbul, Mexico City and Tokyo, for example. All teachers at the college are professionally active in their respective subject areas and contribute to creating unique projects with the students, providing experience and insight into the hot topics and areas in the industry here and now. To our delight, many of the leading figures in the sector received their training at Forsbergs Skola.